Dr. Kevin Boyack is in the Computation, Computers, and Mathematics Center at Sandia National Laboratories. Richard Klavans is with SciTech Strategies, Inc. They are interested in the mapping of science as a platform for planning and evaluation on national, corporate, and personal levels. Science can be thought of as containing themes and paradigms; themes are current areas of research while paradigms comprise the dominant tool sets and existing knowledge that are used by current researchers. To generate this map, Boyack and Klavans recursively clustered (using the VxOrd graph layout tool) the 820,000 most important papers referenced in 2003, resulting in 776 paradigms. The most dominant relationships between paradigms were also calculated and are shown as lines between paradigms. The map of scientific paradigms comprises a reference system that can be used for multiple purposes. 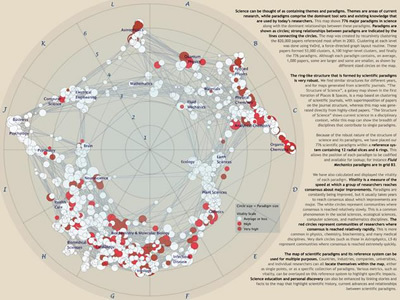 Countries, industries, companies, and individual researchers can all locate themselves within the map, either as single points, or as a specific collection of paradigms. 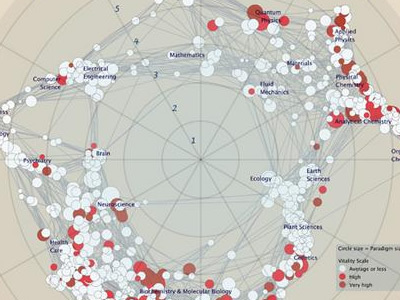 Science education and discovery can also be enhanced by linking stories and facts to the map that highlight content and relationships between scientific paradigms. This map will be on display at the NYPL Science, Industry, and Business Library, New York, as part of the "Places & Spaces: Mapping Science" exhibition, from April 3rd - August 31st, 2006.